It's rather an anomaly that we've been to the movies twice in one year - let alone in one month! Actually, if I were being honest, we probably average about 3 movies in the theater a year, but that is seriously effected by the release of The Lord of the Rings trilogy and Chronicles of Narnia in recent years. Most of the time, we'd rather just wait and see it on DVD in the comfort of our own home. I mentioned the other day that Jonathan had a guy's night out and went to see a movie with a friend. In return, he offered me a girl's night out so I met up with a friend for lunch and a movie date. My friend and I went to go see the new Jim Carrey movie, A Christmas Carol. (If you click on the title, it will take you to a Youtube video of the trailer which is worth seeing.) I was thinking that it was a live action film and didn't realize it was 3D animation. I knew it was Jim Carrey but I didn't think they could Carrey-ize the film too much without making bibliophiles everywhere completely livid. The movie DID follow the book very, very well. I was very impressed with out on target it stayed and how non-Jim Carrey it was. (I really only like him in more drama oriented films.) Pride & Prejudice fans will be interested to know that Colin Firth plays Scrooge's nephew, which is something I discovered during the opening credits. I have to say that it was quite amusing to see Mr. Darcy animated in a 3D format. However, despite my early chuckles, I thought that the animation made the ghosts WAY too scary. It's rated PG but even *I* had to look away once or twice. It's not over the top but it's quite enough. Certainly anyone who is sensitive to the idea of ghosts, spirits and spiritual warfare should take care and, quite frankly, I wouldn't personally recommend it for children under the age of 12. That said, I'd read aloud the original story to anyone aged 9 and up, I think. We tried watching Mickey's Christmas Carol this year, but Jacob Marley dragging chains about was waaaay too much for a three year old so we'll tuck it away for a few years. I believe I was around 8 or 9 when I first started watching Mickey and perhaps that is the best introduction. A Christmas Carol is one of my favorite (ok, ok...my ONLY favorite) of Dickens and I was happy to go see this film but wished they hadn't made Jacob Marley so very frightening. A bit too much but thankfully nothing that lingers with you too long. Which is probably not what the movie producers want to hear, but oh well. There you have it. My very good friend was in town this past weekend and we had a night out as a group (got a babysitter and everything! woo hoo!) and went to go see the new Sherlock Holmes movie. Now, here is where I confess that I did not do ANY research on it whatsoever. Grant it, I saw the movie trailer (when I went to see A Christmas Carol) and although it had a dark tone to it - hey! It's Sherlock Holmes! * Some really good lines. * I did NOT realize (none of us did) that the entire story line revolved around a satanic cult. * Although you might argue that the movie pitting evil against good, and the outcome was predictably good, then it was an acceptable watch. * However, and maybe this starts getting into Harry Potter arguments, I don't know... but the way Holmes investigated the cult was by performing the rituals (albeit with a few variations) to unlock the mystery. * You might also argue that in the end Holmes proved that the cult was all smoke and mirrors with little true power. The problem with the last argument is that evil is not smoke and mirrors and the cult does have power. (Knowing that is what makes the movie a "suspense/thrilled/mystery" in the first place. It's "unexplainable" terror.) Spiritual warfare does exist and it's not exactly something that I find very entertaining. In other words, you might explain something away on a film but it doesn't make it any less real. I could link up to stories online of people who are involved in cults (but I will not do so) and it's not entertaining, nor is it any laughing matter. So I ultimately had a problem with the Sherlock Holmes movie because he fought bad with bad and then relied on his own mental capabilities to escape ultimate harm. It was very unrealistic. Witty. But untrue. Misleading. Problematic. Of the two movies though, as much as I disliked Sherlock Holmes, I enjoyed it more than A Christmas Carol because it gave more food for thought. I have been thinking a lot about the book Word Pictures, by Godawa (click on the title to see my review) and have wondered what his opinion on this film would be. I'm STILL thinking about the movie. It is possible to know God in it, because He was clearly there, even though Hollywood didn't give Him a place. He was there because He is truth and evil will always be answered with truth. I wouldn't necessarily recommend this movie. In fact, I really wouldn't recommend it at all! But as I seem to have accidentally stumbled into it, in a manner of speaking, I find the thoughts that the movie represented very intriguing - and mostly terrifyingly sad. Part of me wants to say, "If only spiritual warfare like that WERE a joke." And the other part of me surprisingly (to me anyway) feels grateful that it exists but that the battle has already been won. And not, mind you, by Sherlock Holmes! We'll try and make this one the first movie that Bookworm1 gets to see in theaters. With any luck at all, we'll get to see this one on opening night. It is now officially circled in red on my calendar. ;) I won't hold my breath or anything - but it sure would be fun! Anyone else know of anything fun coming up? I seem to find out about movies when they hit Blockbuster - long after they are OUT of the theater! But I'll take a suggestion if you have one. Those are the same movies I want to see this year - Toy Story and Narnia. lol My hubby and I only see two or maybe three movies in the theater each year and we try to be picky so that whatever we see in theaters is really good. Um...yeah, I don't know the last movie I saw in the theater...possibly Prince Caspian, but I'm pretty sure we didn't even make it to that! (but we own it). Toy Story 3 might happen...with Meghan (age 3)...and I will put 12/10 on my calendar! Honestly, I didn't have the desire to see Christmas Carol and definitely NOT Sherlock Holmes. Good to know about Sherlock Holmes. We'll probably wait for DVD on that one although I had had several friends mention how great it was. We're definitely going to see Toy Story 3 - it opens the weekend after my husband's birthday and the girls are going to take him to see if for their gift to him. :) There are several that I'm interested in seeing: Alice in Wonderland, Iron Man 2 ... but those can definitely wait until DVD for me. There's one called Date Night that looks really really funny and I've just added Narnia to my calendar thanks to you. I was wondering when the next one was coming out! 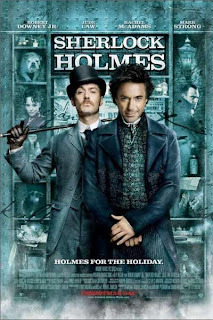 We recently saw a preview of Sherlock Holmes. It looked ok until Joel read the review on Plugged In. Then we decided it wasn't so great. We started reading the Christmas Carol as a family tradition last year. My 6 year old squirms some but seems to like the story. Much of the vocabulary is advanced for him so that helps. We also watched the Muppets Christmas Carol and all my gang loved it. They weren't too scared, although they did have some tense moments with the ghosts. I highly recommend that version! DH and I were going to see A Christmas Carol but we saw Blind Side inside (I know, I know--how unliterary of me--but it was AFTER Christmas!). I thought Sherlock Holmes looked a little too Hollywood-ized in the previews for my taste. Stephanie @ Olive Tree - Yes, I was really excited to see Alice in Wonderland too, however, after finally sitting down and watching a preview for it, I'm thinking it's more a Jonathan movie than a Carrie movie. =D We'll see. It does have appeal. Amy - Yes, we both very much want to see The Blind Side. Several friends saw it and said it was excellent. Wish we had seen that one instead of one of the others this past week. Ah well! That's what DVDs are for, right? I didn't know Voyage of the Dawn Treader was coming out this year! Thanks for that. Also, I enjoyed your review of Christmas Carol. It's the only Dickens I've read and really wanted to see it but was afraid of the Carrey-ni-zation of it too. I'll be sure to Netflix it. On an aside - our church did Christmas Carol and they made Marley soo scary! Everyone wondered why they didn't let us know!! Many children had to leave! !